It can be hard for parents to choose the perfect bassinet for their babies. It gets even harder when you’re looking for the best bassinets for bigger babies as there are more factors to take into account than looks and portability. A durable bassinet with a decent weight capacity is usually enough. But, if you’re looking for the best you’ll want to know more than that. Here are three of the best bassinets for bigger babies. Each of them is designed with a larger weight capacity and they are differentiated mostly by the secondary features or the actual design. Find out which one is best suited for your baby and your lifestyle. This travel bassinet can be used at home or on the road and has a weight capacity of 18 lbs which is good for bigger babies. It has outdoor protection that doesn’t hinder proper air circulation as well as a stable base for the child’s back. The Big Oshi bassinet is a versatile model. It has a sturdy bed base made of wood will favor a healthier vertebra development for the baby. It has features that can be used inside and outside. 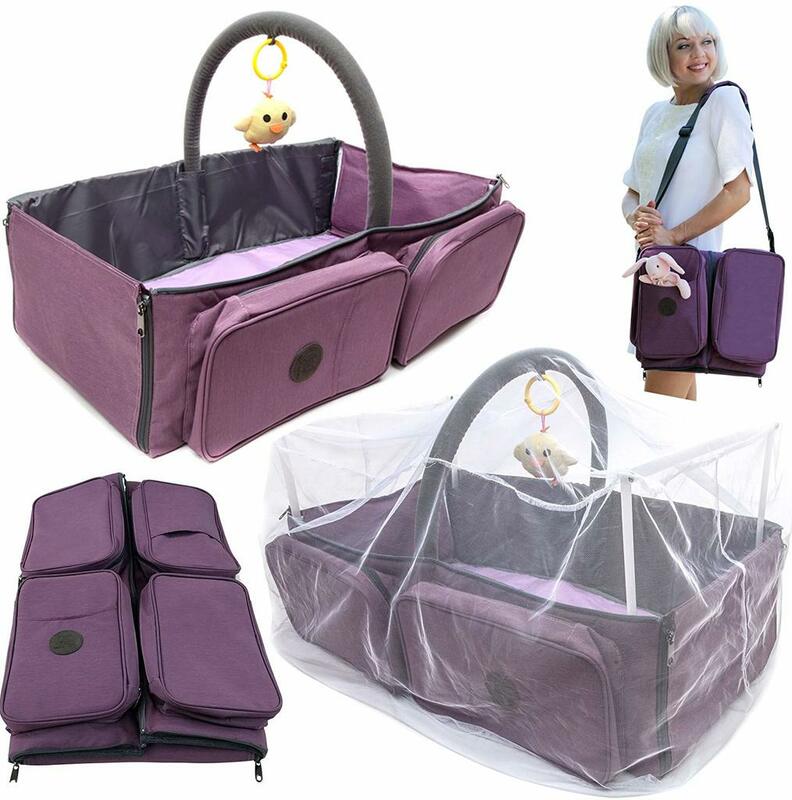 For outdoors use, the bassinet is equipped with an elastic mesh net which keeps insects, dust particles and other debris. Many like this bassinet for travel purposes too. Both sides have canopies which increase the level of comfort and protection. The zippers, on the other hand, are a bit tricky to work with. There is a high likelihood of waking the baby up if you work the zippers at the wrong time. Also, some have experienced issues with bassinet mattress being too thin. The overall durability of the bassinet is impressive for a lightweight design. The Emma model is most popular in the market. This Cashay portable bassinet is budget-friendly, durable and works both inside and outside. This bassinet has more to offer than just extra weight capacity and room. Often times, the best bassinets for bigger babies are those that have multiple attachments that make it a viable choice all over the world. This bassinet can be used as a diaper changing station, diaper bag and a baby nap mat. This bassinet is more than just a portable bassinet. It turns into an entire baby care station when needed. 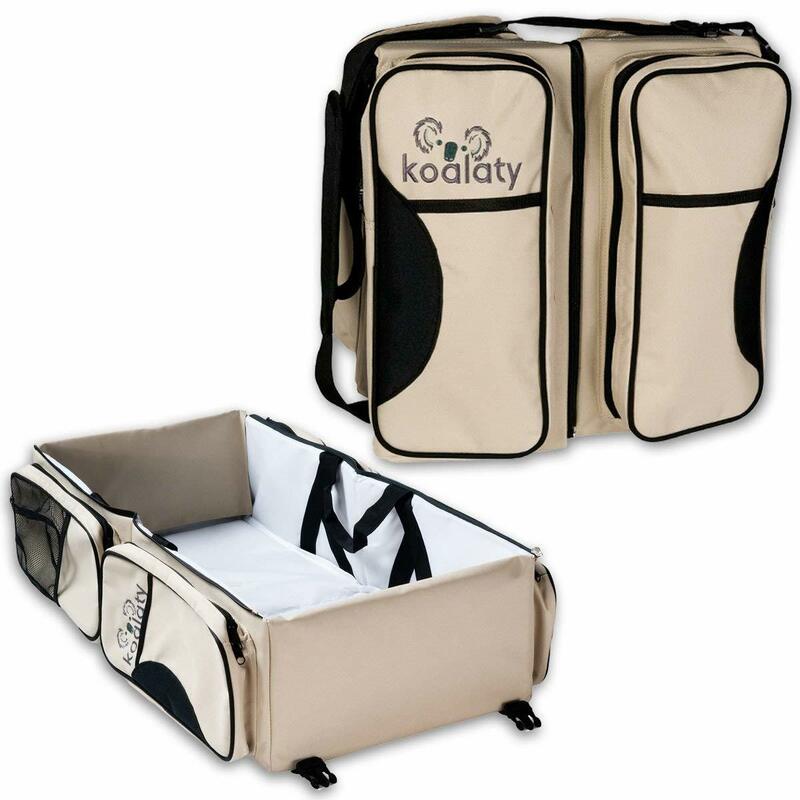 The diaper bag unzips on one side so that you can convert the bassinet into a diaper changing station. It also comes with four large pockets for your traveling essentials especially if you have a bigger baby. The Zika protective mesh net is a great feature that can give you peace of mind when on the road. It’s also easy to unzip. Having quiet zippers is important if you want to catch some shut eye while your baby’s taking a nap during the day. One of the pockets has high-end insulation if you want to leave the house with a bottle of warm milk ready. The center arch is sturdy enough to support toys or anything you might want to hang to keep the baby’s attention. The mattress is waterproof and quite soft. While it’s comfortable for the baby, some parents might prefer a harder surface that stimulates a correct development. There’s also a toy included for the arch so you don’t have to bother picking one out of hundreds of models available in stores. What makes the best bassinet for bigger babies? According to Koaltay, to make the best you have to make it adaptable, sturdy, and easy to carry. Their 3-in-1 model accomplishes all of that. This portable multi-functional model is all the conveniences in one. Its a waterproof bassinet and converts into a diaper changing station by just unzipping a few pockets. None of the pockets are insulated but they’re quite big and should be enough to carry diapers, clothing and everything you need on hand for a short trip. The sides are cardboard reinforced but they also have a thick soft padding for your baby’s comfort. This is also nice to have if your baby is larger and has a tendency to squirm a bit. You won’t have to worry about the bassinet’s stability. Speaking of comfort, the polyester is waterproof and breathable and it’s also easy to remove and wash by hand or machine wash. 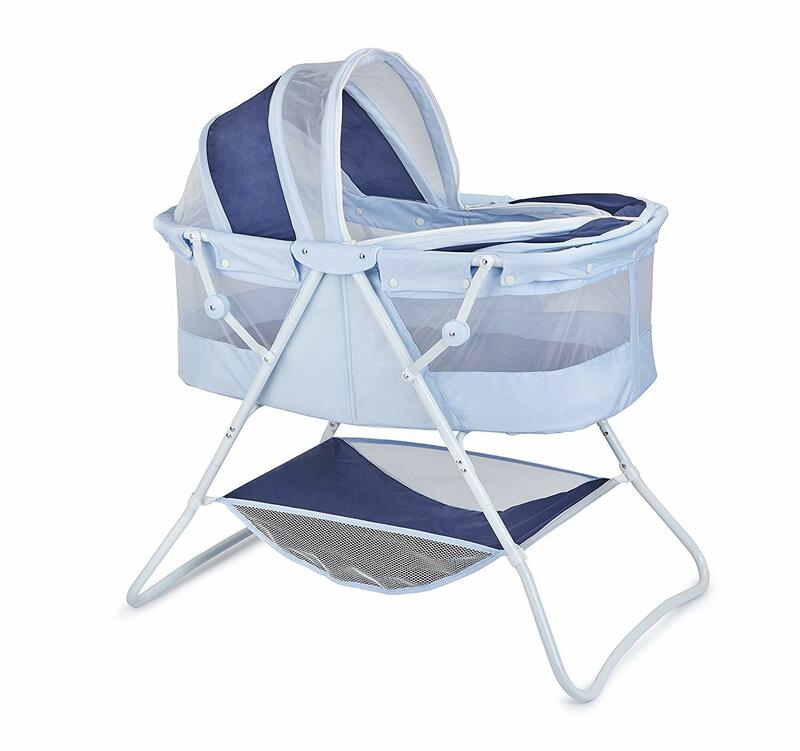 Although the breathable materials make it a good outdoor bassinet, the absence of a mesh net means that you’re not exactly getting the complete package. On the upside, for a 3-in-1 travel bassinet for bigger newborns, it’s the most affordable one on our list. The Cashay Baby Bassinet impressed us the most. Not only does it convert into a large diaper changing station but it also has a unique safety feature in its Zika protective net. It also has four pockets, one of which is insulated for storing warm milk while traveling. It comes with a hanging toy already included and stroller clips for when you’re tired of carrying it. Basically, it has the best combination of safety and quality of life features to be the top pick out of our selection of best bassinets for bigger babies. But if you’re looking for a traditional bassinet for the home or travel, you can’t go wrong with the Big Oshi bassinet if you have a bigger baby. It’s available in the ever popular pink and light navy. The bassinet is perfect for your baby.